OTTAWA ai??i?? Ottawa council voted 24-0 Wednesday morning to formally approve a contract for the first stage of light rail transit in the capital. To cost $2.1 billion initially, the 12.5-kilometres rail line will run from Tunneyai??i? ?s Pasture in the west to Blair Road in the east, and pass under much of downtown in a tunnel. The city chose the Rideau Transit Group, a consortium of engineering firms, to build the line. 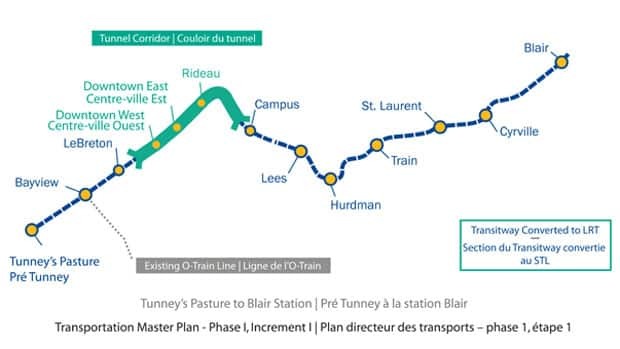 The first stage of construction starts in February with the addition of lanes on the Queensway to carry express buses while the existing bus-only Transitway is closed during the conversion to rail. Just to be clear that Ottawa council meeting was Wednesday December 19, 2012 not this past Wednesday. This vote was a rubber stamp the actual approval vote was in April and was 18 to 6 if memory serves me well.